Samuel Vince (6 April 1749 – 28 November 1821) was an English clergyman, mathematician and astronomer at the University of Cambridge. He was born in Fressingfield. The son of a plasterer, Vince was admitted as a sizar to Caius College, Cambridge in 1771. In 1775 he was Senior Wrangler, and Winner of the Smith Prize at Cambridge. Migrating to Sidney Sussex College in 1777, he gained his M.A. in 1778 and was ordained a clergyman in 1779. He was awarded the Copley Medal in 1780 and was Plumian Professor of Astronomy and Experimental Philosophy at Cambridge from 1796 until his death. He became Archdeacon of Bedford in 1809, and died in Ramsgate. Vince also published the pamphlet The Credibility of Christianity Vindicated, In Answer to Mr. Hume's Objections; In Two Discourses Preached Before the University of Cambridge by the Rev. S. Vince. In this work, Vince made an apology of the Christian religion and, like Charles Babbage, sought to present rational arguments in favor of the belief in miracles, against David Hume's criticism. A review of this work with direct quotations can be found in The British Critic, Volume 12, 1798. ^ a b c "Samuel Vince (VN771S)". A Cambridge Alumni Database. University of Cambridge. ^ Vince, Samuel (1795). "The Bakerian Lecture. Observations on the Theory of the Motion and Resistance of Fluids; With a Description of the Construction of Experiments, in Order to Obtain Some Fundamental Principles. By the Rev. Samuel Vince, A. M. F. R. S.". Philosophical Transactions of the Royal Society of London. 85: 24–45. JSTOR 106943. ^ Vince, Samuel (1798). "The Bakerian Lecture. Experiments upon the Resistance of Bodies Moving in Fluids. By the Rev. Samuel Vince, A. M. F. R. S. Plumian Professor of Astronomy and Experimental Philosophy in the University of Cambridge". Philosophical Transactions of the Royal Society of London. 88: 1–14. JSTOR 106967. ^ The British Critic, Volume 12 (1798). F. and C. Rivington. pp. 258-263. "The Wright Brothers: Designing the 1900 Wright Glider". National Air and Space Museum. Smithsonian Institution. Archived from the original on 2011-09-27. Lee, Sidney, ed. (1899). "Vince, Samuel" . Dictionary of National Biography. 58. London: Smith, Elder & Co.
Sir George Gabriel Stokes, 1st Baronet, was an Anglo-Irish physicist and mathematician. Born in County Sligo, Ireland, Stokes spent all of his career at the University of Cambridge, where he was the Lucasian Professor of Mathematics from 1849 until his death in 1903. As a physicist, Stokes made seminal contributions to fluid dynamics, including the Navier-Stokes equation, and to physical optics, with notable works on polarization and fluorescence. As a mathematician, he popularised "Stokes' theorem" in vector calculus and contributed to the theory of asymptotic expansions. James Challis FRS was an English clergyman, physicist and astronomer. Plumian Professor of Astronomy and Experimental Philosophy and the director of the Cambridge Observatory, he investigated a wide range of physical phenomena though made few lasting contributions outside astronomy. He is best remembered for his missed opportunity to discover the planet Neptune in 1846. Samuel Hunter Christie FRS was a British scientist, physicist and mathematician. Tiberius Cavallo was an Italian physicist and natural philosopher. John Theophilus Desaguliers FRS was a French-born British natural philosopher, clergyman, engineer and freemason who was elected to the Royal Society in 1714 as experimental assistant to Isaac Newton. He had studied at Oxford and later popularized Newtonian theories and their practical applications in public lectures. Desaguliers's most important patron was James Brydges, 1st Duke of Chandos. As a Freemason, Desaguliers was instrumental in the success of the first Grand Lodge in London in the early 1720s and served as its third Grand Master. 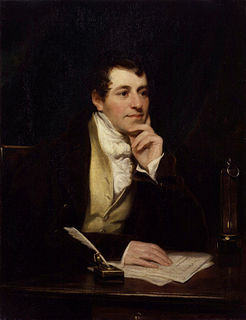 John Henry Pratt FRS was a British clergyman, astronomer and mathematician. A Cambridge Apostle, he joined the British East India Company in 1838 as a chaplain and later became Archdeacon of Calcutta. Although nominated as Bishop of Calcutta, the decision was rescinded at the last moment with George Cotton being appointed to the position. A gifted mathematician who worked on problems of geodesy and earth science, he was approached by the Surveyor General of India to examine the errors in surveys resulting from the attraction of the plumb-line to the mass of the Himalayan mountains. This led him to develop a theory based on a fluid earth of crustal balance which became the basis for the isostasy principle. He died in India of cholera while on a visit to Ghazipur. John Colson (1680–1760) was an English clergyman and mathematician, Lucasian Professor of Mathematics at Cambridge University. George Fordyce was a distinguished Scottish physician, lecturer on medicine, and chemist, who was a Fellow of the Royal Society and a Fellow of the Royal College of Physicians.